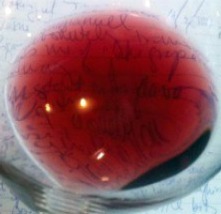 A Vogne-Romanee over my notes. I’m thinking of changing the name to “Wine Wednesday.” The W’s go so well with the day I happen to write these posts. Opinions? I’m also not sure anyone is reading — my more quirky culture posts seem more popular — so give me a shout out in any case to let me know your thoughts. I was invited by my employer to attend a private wine tasting hosted by a major import company, featuring the wines of M. Chapoutier. It was held at the Institut Francais on Rothschild Blv in Tel Aviv. I’m a big fan of Rhone Valley wines, Syrahs can drive me nuts, I swear. But, they’ve got to be good, and it’s a region that exports a lot of mediocre stuff. Apart from the exceptional blini being served along with excessive amounts of French cheeses, a knowledgeable representative of Chapoutier presented a long array of his wines. The only ones of note to me were the “Ermitage” wines. Ermitage (without the more common “H” – Hermitage – is commonly used to denote the better single vineyard wines) wines that were best included their “Le Pavillion” and “L’Ermite.” At the time I didn’t know that they were priced at 147 and 176 Euro per bottle, but it makes sense. These single vineyards are ancient, the Pavillion on the slope side of the larger pf the two Hermitage hills, and the L’Ermite at the top, where the soil is very poor, the ancient vines really needing to fight to survive, and producing a terribly small yield. The Hermitage region is one I will be keeping an eye on. These wines are bold and full of fruit, that gorgeous cassis I adore so much, that rich magenta color – so different from the Bourgognes we drink often at the wine shop. Interesting facts: Hermitage wines were the favorite of the Czars of Russia, and in fact, in the 19th century Bordeaux wines were “hermitaged” (mixed with Hermitage) in order to fetch a higher price. Cool beans. A rare gem, Clos de Tart has been owned by the Mommessin family since 1932 — only the third proprietor of this historic domaine founded in 1141 by Cistercian nuns, the Bernardines de Tart. Located on the very best slopes of Morey-Saint-Denis in the Côte de Nuits, Clos de Tart, only 7.53 hectares (18.6 acres) in size, is the largest grand cru monopole in Burgundy, with a picturesque, 15th-century, stone wall surrounding the grand cru vineyard. Clos de Tart carries the distinction of being one of the few grand cru monopoles in Burgundy that comprises an appellation in its entirety. Clos de Tart makes just two wines. Low-yield, old-vine vineyards are harvested by hand and vinified in six separate lots, and the best lots achieve the bottled status of Clos de Tart Grand Cru. 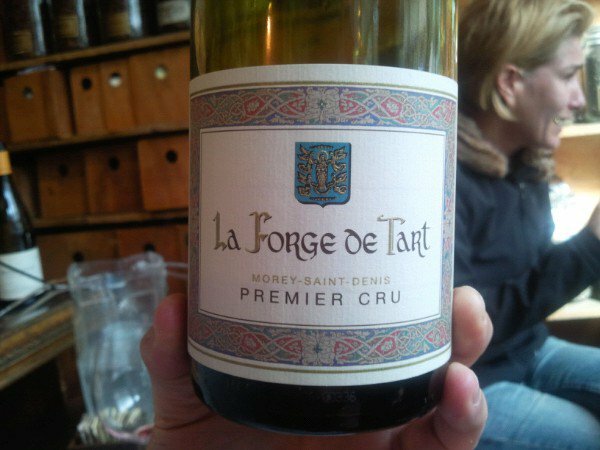 In some vintages, the domaine also produces a second wine called La Forge de Tart Premier Cru, which is typically made from the younger vines (25 years and under). That’s it for me this week, I’m afraid. I’m exhausted and expected at the wine shop in under an hour. Night before last was an all-nighter, spent writing a short story I should have been developing for over a month. Oh well. I’m still very proud of what I produced. Perhaps I’ll post it here…after a couple revisions. Human milk has been in the news a good amount these days… Cheers to you all! Always remember to drink good wines…life is far too short. Thanks, Noam. I’m glad you like them. Stop by my shop sometime. I can set you up with some interesting stuff to taste. I’d love to, when are you there? (Wednesdays, I presume). This week’s schedule is weird for many reasons and I won’t be in as much. Sat nights, always. Never Tuesday or Friday. On Sat, 26th, we’re hosting a huge Burgundy wine fest, all day. Good time to come.